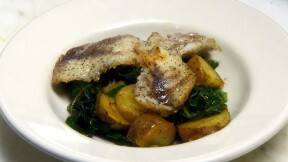 Enjoy lightly sautéed Swiss chard, fingerling potatoes and shallots topped with fresh tilapia. Drizzle browned butter over the finished entrée for a quick, healthy and fulfilling meal. Pre-heat oven to 350°. Clean and roast potatoes until tender, about 20 minutes, set aside to cool down a bit before cutting. Plate kale-potato mixture, place tilapia on top and pour brown butter over fish.